Swagbucks has announced a lot of special promotions for those of you looking for deals this Holiday season!So if your still shopping here is a great way to get back while you give! First, from 12/1 through 12/26 if your a new user and you spend $50 or more in Shop, you earn a 250 SB bonus! 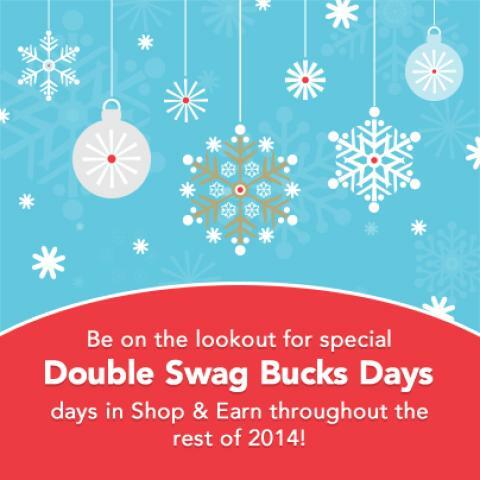 If you want an even more rewarding Shop experience, Swagbucks is running a series of Double Swag Bucks Days and throughout the holiday season! Plus a special contest where you can win even more! If you're not a member of Swagbucks yet, there's still time to earn free gift cards towards your holiday spending! Just click here to sign up. Double Swag Bucks in ALL Shop & Earn stores! Spend at least $1 in Shop & Earn between December 12th – 15th and you’ll receive an entry into a drawing for one of 51 prizes!